Emmy-winner Richard Thomas stars in this exciting family adventure based on Johann David Wyss's Timeless book. Join the shipwrecked Robinsons as they struggle together to make a new life on a remote desert island. Survival (3 episodes) - The marooned Robinsons and a band of shipwrecked survivors make a new home on a remote island. Island of the Gods (3 episodes) - David Robinson and his son, Ernst, rescue a tribal king from his treacherous brother. Invasion (3 episodes) - Pirates, led by the notorious Samuel Scraggs, take over the Robinson tree-house. Princess From the Sea (3 episodes) - Ernst falls in love with a tribal princess fleeing her war-torn island. Two cultures unite as she uses her native skills to help them build a new fortress. Captives (3 episodes) - The Robinsons' idyllic island life is shattered when Parsons kidnaps daughter Christina, and David is bitten by a strange insect. The Ghost of Raven Jones (3 episodes) - Ernst is captured by the mythical pirate Raven Jones, who has been driven mad by his years of solitude on the island. The Treasure Hunt (3 episodes) - The Robinsons first Christmas on the island is a memorable one, with a raging storm and the return of pirate Samuel Scaggs. Star-crossed Lovers (3 episodes) - David objects when Parons' good-hearted sidekick, Ben, falls in love with daughter Joanna. DVD 5:Paradise Lost (3 episodes) - Newlyweds Ben and Joanna's happiness is short-lived when Parsons leads a pirate attack on the family. The arrival of a merchant ship rescues the family, who sail to Boston, where David stands trial for the murder of Parsons' brother. Boston (3 episodes) - The Robinsons' great adventure ends, but as they struggle to adjust to civilization again, is a new and greater adventure on the horizon? 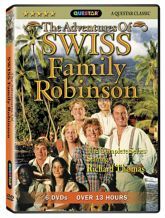 Bonus Features - The Making of the Adventures of Swiss Family Robinson.